I’ve been blogging for a LONG time and I’ve never had another food blogger guest post before…but I do believe things are ‘gonna be a-changin.’ I’m admittedly beyond overwhelmed right now trying to manage a full time business, this blog, sell my home and be a part of the support team for my daughter Lauren as she heads to battle with breast cancer. I’ve had some blogging friends offer to help and that YES was off the tip of my tongue immediately. My friend Shanna with the blog Pineapple and Coconut is the first and I’m honored to have her and this gorgeous drink be a part of The Friday Cocktail. Pink is my new favorite color remember? I’ve always loved Cosmopolitans but have to admit never with raspberries which I love. That will change soon. This cocktail is going to brighten my weekend when it’s forecast we’ll be snowed in with up to a foot of snow. Want to join me? Thanks so very much Shanna…it’s all yours! Hi I am Shanna, and I run the blog, Pineapple and Coconut, a blog about healthy eats, sweet treats and a little bit of everything else. The “everything else” being our current kitchen remodel that we are DIYing most of, some of my crafty endeavors ( I like to sew and paint) and I’m also big into the fitness industry and basically anything else I feel like posting about. So while you will see mostly recipes on my blog, once in a while some other stuff will pop up! This cosmopolitan is a very special drink to me, and I am glad to be sharing it for several reasons. This was the first drink I had when I turned 21. I was out on the town with my late friend Kristin and she wanted to take me out to a fancy bar in town and celebrate finally being allowed to drink legally. Because, you know, I totally hadn’t had a drink before that! When I told the bartender I wanted a cosmopolitan but to make it special for my 21st birthday, he said he had something perfect in mind, a raspberry cosmopolitan. It was SO good. Not quite the same as this one I’ve made here, but I will always remember it. Pretty impressive considering most don’t remember their 21st birthdays. When I read Barb’s post about her daughter’s recent diagnosis, I was heartbroken for them both. Cancer is beyond scary, especially breast cancer. I knew I wanted to make something in Lauren’s honor. Besides being a wife, mom and blogger, I also am an ultrasound tech and used to do breast ultrasound at a cancer center in Colorado. I saw many women of all ages and was fortunate to be a part of their care team. So I know about the journey Lauren is about to embark on and know that she is in really good hands where she is being treated and am certain she will win this battle. I have several friends that are long time breast cancer survivors and are some of the strongest women I know. So this Very Pink Raspberry Cosmopolitan is in honor of Lauren as well as every other woman battling breast cancer. Cheers! 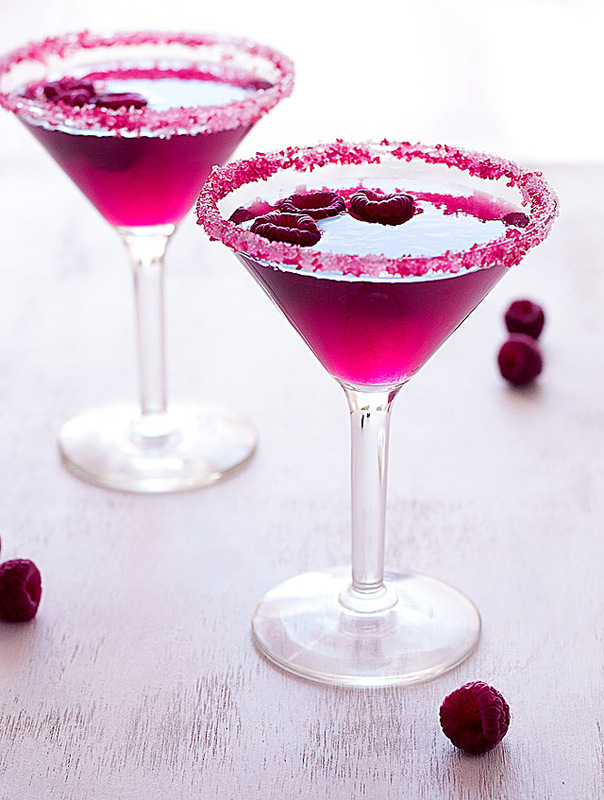 This is truly a VERY pink Raspberry Cosmo! 1 ounce simple syrup (Bring equal parts sugar and water to boil in a saucepan until the sugar is dissolved. Cool). Combine 2 cups of frozen raspberries and 1 1/2 cups of water and bring to a simmer, mashing the berries against the sides of the pain to release their juices. Strain into a cup or bowl scraping the seeds with a spatula along the bottom of the strainer to extract all the juice. Fill two standard size martini glasses with ice and water to chill. In a shaker combine the Raspberry Juice, raspberry liqueur, vodka and lime juice over ice and shake a few times until ice cold. Pour out the ice water from the martini glasses and dip the rims of the glasses in simple syrup then into pink sugar crystals. 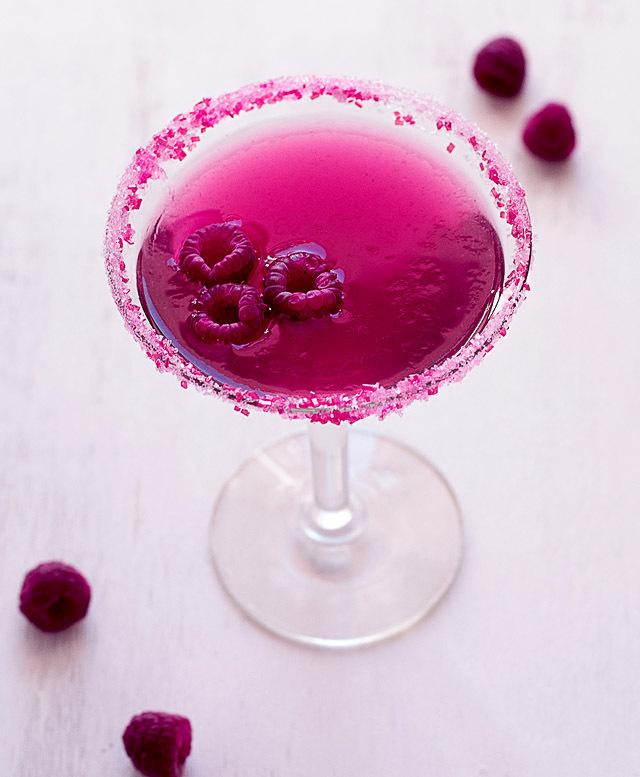 Divide the mixture between the two glasses and garnish with raspberries. what a beautiful cocktail, love this and thank you for this recipe, nice change to my “go to” cocktails! Ran into this post on Pinterest and its absolutely beautiful and delicious!! I, too, am finishing up my battle with breast cancer and i’m sending good vibes and prayers for Lauren!! Thanks so much Sandy; our best wishes to you as well! Thanks Stacy; all I can do to keep up with everything I admit. Lauren’s chemo started Tuesday; been a rough week but we’re trying to stay positive. 1 down; 15 to go! Prayers going to you and your daughter. Good luck with all your other stuff. Gorgeous looking drink! Thank you; very much appreciated. I am so sorry to hear about your daughter, Barb! I wish her the very best–I will keep you all in my prayers. Good luck with selling your home –the Colorado housing market seems very good right now, so I hope that works our well for you! This was so nice of Shanna to do this wonderful post–what a beautiful lookig drink! It sold in a month…considering not long ago I knew people who had a home not sell in a year or more, I feel most fortunate to have that done! Now to find a place to live! 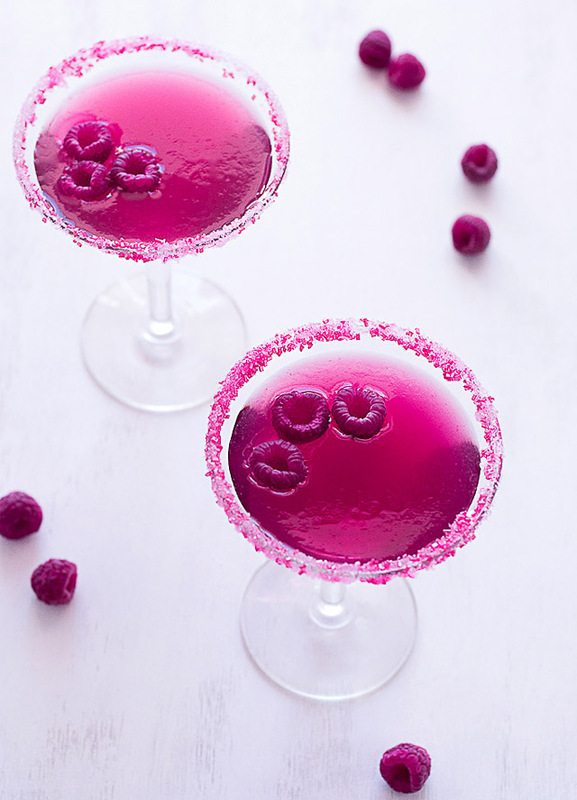 These cocktails look so delicious!! I want to try them right now! These look so beautiful, who wouldn’t want to drink one of these? Shanna, I’m sure your offer to guest post and your background must be very comforting. You’re a very good friend. What a beautiful drink! I just bought some raspberries at the store this morning and this would be a delightful way to enjoy them! Absolutely gorgeous and I know I would love it being a raspberry fiend! What a beautiful cocktail and so appropriate! Virtually “raising my glass” !!! A stunning cocktail, Shanna! Thank you for sharing it and your lovely, thoughtful words. Gorgeous cocktail, Shanna! And Barba, I can’t stop thinking about your Daughter. I have a daughter who is just turning 3 and as a mom, my heart goes out to you. Please, if there is anything I can do, let me know. This looks soo beautiful! I’ve never actually had a Cosmopolitan but this looks like it would be a great first one. Welcome to Shanna and the perfect pink drink for Barb and Lauren. It looks so beautiful and it looks just as delicious! Nice drink, great pictures. The lighting on that top one is perfect. Perfect guest post! Thanks so much. Lovely post with a beautiful message. I am so pleased to see that you will have so much support in these coming months. You are so generous in time and spirit my friend. What an absolutely beautiful cocktail! Makes me want to run out and buy a box of raspberries. A beautiful cocktail in Lauren’s honour and a very encouraging post for her and her family. #Waunstrong!! What a sweet message and beautiful drink. You photos make me want to just dive into one.